I’ve been observing the SDGs as a natural systems scientist since 2013 when I saw with some surprise that the one topic both Country delegates and Civil Society groups could agree on was the wording of the ideals for global development. Even when the Co-Chairs, Ambassadors Korosi, and Kamu, began persistently asking for the discussion to turn to means and methods it never did. Ideals are wonderful, but the SDGs are responding to a still growing global disruption of human and natural cultures, a problem not studied or discussed. I find somewhat the same problem with this year’s otherwise wonderful “Spotlight on Sustainable Development 2018” (see www.2030spotlight.org). Its critiques seem excellent and hard not to agree with, but also seemed to assume ideal purposes lead to ideal results, as the drafting of the SDG’s did. The real problem is that the growing harm to human cultures and nature caused by accelerating growth is a rapidly moving and expanding target. As growth presses the limits of the earth and challenges the world to ever faster rates of change, the damage to nature and human society is more and more lasting. That’s a conclusion you can reach from many directions I think. The communities the SDGs aim to help seem mainly deeply rooted old cultures that are now “failing to thrive.” That is a living systems problem, not a numbers problem, as the SDGs were designed to solve. Failing to thrive is more like a “lack of meaning in life” dilemma, requiring a different approach. It’s also a symptom that one can use to map the problem worldwide and begin to look at its real dimensions. Failure to thrive seems to hit both indigenous cultures worldwide and communities within economies where “creative destruction” is leaving lasting scars, like rural flight or outsourcing that hollows out a region. One example is the deeply alienated culture giving support to Donald Trump in the US, distressed by the world changing so much around them. There are also non-thriving local cultures in North, Central, and South Africa, as well as in the Middle East and North, Central, Southern and Eastern Asia, as well as in Oceana, Australia, North and South America. It’s not “the same old thing,” but a truly accelerating global plight, seeming to be of all the cultures that didn’t welcome or were disrupted by the intrusive growth of the world powers. Human cultures are truly the crown jewels of humanity, though, where most of our gifts come from and are on display. They are the unique individual species of the human ecology. If you think about it, there is no other place on earth for the safekeeping of all our ancient accumulated ways of knowing and living. Each culture either crafts its separate way of knowing and living or branches off from another. They are our most important gift, evidently now absorbing a great deal of abuse. With each culture being its own “knowledge system” it keeps people from making sense of any other culture, or even our own. If you trace the evidence, it does check out. We get the large part of our ways of understanding things during early childhood, by what you might call ‘osmosis’. Some say it’s “too close for us to see,” or that our mental way of seeing is functionally like a camera and its lens, that are never visible in the pictures they take. Cultures also have a deceptive “cellular design.” Their ways of knowing and living are internally shared, and not experienced from the outside. Even with extended immersion, an outsider does not develop a native feeling for another culture’s roots. The great challenge we face today is that growth is an ever faster process of expansion and change, *doubling* its demands on the earth and humanity every 20-30 years. That radical rate of increasing demands is what eventually overwhelms the adaptability and resilience of people and the earth. Living things are being pushed to keep mechanically doubling numerical returns for culture-blind investors, as if the earth was unoccupied. That’s how the English occupied North America, a hundred years after the first settlements rapid expansion began with importing slave labor then a wave of settlers swept across the rest of the continent, as if it were unoccupied. Elsewhere the economic powers built systems for globally harvesting resources, placing overseers where needed to manage their access, as if there was no one else there. Today it continues with how global capitalism still relates to the world, measuring its success in rates of accelerating expansion alone, as if no one is here. 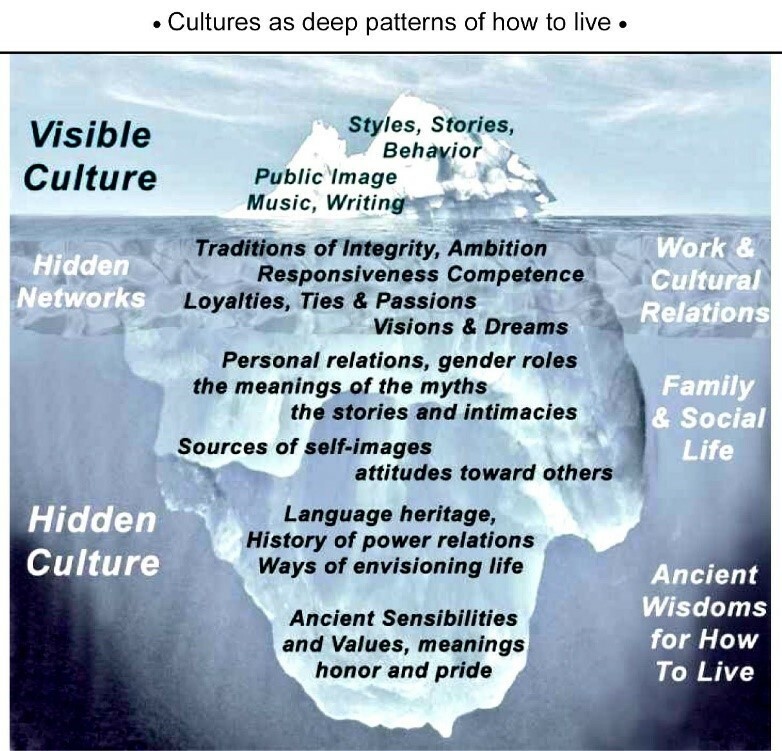 What’s most surprising perhaps, is how very effective our cultural blinders are in hiding our blindness to our own and other cultures from us. That is, hidden until you have an indicator like the glaring disruptiveness of ever more sudden change. So what would relieve our fast growing societal distress? There’s a new business model expressly for responding to it, to use biomimicry for how nature builds thriving ecologies. If interested there’s a longer discussion article on how healthy cultures are the foundations of healthy economies and the business model for nourishing them that SDG interventions could use ( Culture, Financing for Development and tPPPs). The new business model begins like any business, organism, or culture does, with a period of innovating and vigorous growth, making profits to expand its systems. When the environment responds with increasing resistance or stiffening competition, the new strategy is to choose when and how to switch from maximizing profits for growth to maximizing long-term profitability to pay it forward. That’s done by refining systems to operate in smooth harmony with each other and their world. It’s a more gradual process but would produce more integrated development and be more profitable in the end, to combine human ingenuity and natural design. [*] Jessie Henshaw consults as HDS natural systems design science, sy@synapse9.com, offering insight into nature’s processes of negotiating change. She uses natural systems thinking strategies (NST) with “action research” (AR) and architectural “pattern language” (PL) methods of collaborative developmental design. The start is from recognizing that organizational processes in nature follow a familiar arc, beginning with bursts of innovation, and then refinement, leading to a final release (IRR). That is not unlike how we all do home or office projects, in stages of immature then maturing growth then release, also seen in reproduction. The system produced is first “framed out” with innovations then “filled in” with refinements and “delivered” as the release when ready. Jessie began work on the UN’s SDGs in 2013. Reading Nature’s Signals is her journal of informal research notes, with links to her publications and other work.